I definitely recommend this frame. They are very well made and look great. The packaging they arrived in was very well done. I will definitely buy more frames. I purchased this frame for a stretched canvas family portrait. The canvas was 1.5" so I needed a deep frame to make it work. This frame is deeper than 1.5" but it looks beautiful on my wall. The packaging was very good so the frame arrived undamaged. There was one spot that had no color right on the inside edge, but a sharpie marker fixed that. I would recommend frames from this company. This is a nice frame, my only problem is that I was looking for a float frame and this never said that it was a cap Frame. I had to explain the difference to my client and they were not very happy. However when I offered to purchase another float frame they could not find one that they liked as this one has a little bit of trim and your others don't look like this. Hello Lori! We appreciate your feedback. This collection of Super Canvas Wood Frames are especially designed for deep Canvas but are not labeled as Floater Frames on the website. We have our Floater Frames labeled with a Profile picture and a description to show their unique design. We regret that the frame was not what your client was hoping for, and we can understand you have a business to maintain. In the future, we encourage you to please order the free 3" samples of the frame you are interested in. This will ensure the frame profile is exactly what you are expecting. If you need to return the order, please let us know. We are happy to email you a printable UPS return label. If you need further assistance, we can be reached by phone at 1-800-332-8884 or by email at customercare@pictureframes.com. Thank you for your business. Not having this tiny flat head screw driver really made this process go very hectic. I finally found something that small to turn the bolts. This tiny extra tool from YOU would have made it the flawless execution that I wanted to experience. I was nervous receiving a frame I had to put together anyway but now I had to find a tiny tool, it took more time and slowed up the process..I would really think about adding that small tool to your orders. Hello Michael. Thank you for your feedback. By letting us know about the experience you had putting the frame together, gives us the opportunity to improve in that area. Typically, we send all wood frames assembled, but in your case since the frame was a 30x40,we sent the frame unassembled. At anytime you can request we send the frame assembled for your convenience. The shipping method will be freight instead of UPS ground. Your valuable comment will be shared with our Operations Team. Our goal is to find a way to speed up the assembling process for large frames that are sent unassembled. If u have anymore concerns or questions, please contact us directly at 1-800-332-8884. We can be reached by email at customercare@pictureframes.com. Have a wonderful day. Happy framing! 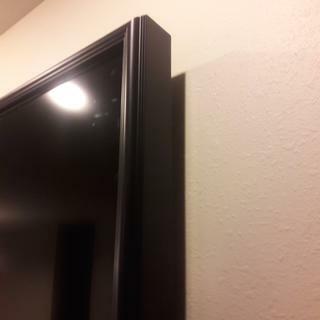 I bought these for a 1" deep canvas frame (two of them) both frames look great, one on each side of my 55" TV. However they are both a;most 4 inches deep, I was disappointed at that. You will not find this quality at your discount stores. I suggest to speak to them on the phone and get what you want because the website is not enough to give you all the details. Hello Randy! Thank you for your insight. We want to give a variety of depths for our customers that frame deep canvas paintings, therefore we offer the Super Canvas Wood Collection. The SP8 is offered as our deepest Canvas Frames to fit the needs of customers with Gallery Depth Canvas. We recommend exchanging the frame for a frame with less depth. We have a frame from our Black Satin Grande Collection that may work. The BGA12. The depth of the frame is 1 1/4". Please give us a call if you would like to return the frame. We can be reached at 1-800-332-8884. We will send you a return label for you to use to return the frame. This frame is well made and is beautiful. I chose it because its lines reflect the wave pattern in my painting titled " Wake of the Ferry". It seemed to me that the frame was designed especially for this painting. The the quality of the frame exceeded my expectations. 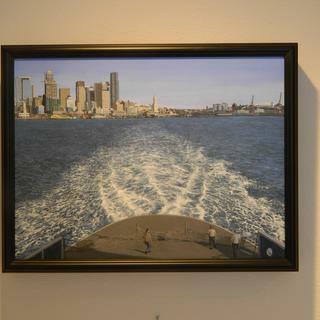 Acrylic painting "Wake of the Ferry", 18 x 24, in a black SP8 frame. I strongly recommend this product. Well worth the price and style. Instead of purchasing and building a shadow box this custom frame was worth the purchase, cost effective and the look is very appealing. I choose this frame because of the added designs as well as the option to have more depth coverage around the sides. It would have been nice to have other color frames in this style to choose from, however, it is still beautiful; can't wait for it to arrive to finish my project. I had a family portrait done on canvas and the stretcher bars were 1 1/2" so I needed a frame with a deeper rabbet and this one looks like it will work perfectly. I need the depth. Would have preferred a very plain front but you don't have that in the depth I need. Need the rabbet depth to frame 3D reliefs. In this case a rabbet depth of 2.5". with a depth greater then 1 7/8. Wish there was more to choose from with this depth. there's not much out there. Your site is great and well done. But, alas, i may have to get out the router if i decide to go deeper. I wanted black. I used chat who suggested this style for my 2" deep canvas. This is a sturdy frame style, excellent for larger frames and shadow boxes. bEAUTIFUL FRAME AND PERFECT FOR THE PROJECT IM WORKING ON. Do you have a frame with a 2.25 inch rabbet? BEST ANSWER: Hello Patricia. This frame is the only frame that would hold your canvas. We do not have a frame with a 2.25" rabbet. Thank you! Do you offer an option for frame + acrylic but with NO foamcore backing? My art is aleady mounted to a 1/2" foam board. BEST ANSWER: Hi Kevin. We do have this option, however, this will need to be ordered by phone at 1-800-332-8884. Thank you! BEST ANSWER: Hello! This particular frame profile and depth is only available in black. Please see our Super Canvas Woods Collection for other colors and profiles. The SP8 is the deepest frame we have available.